The Nobel Prize in Physics 2011 was awarded to three astronomers “for the discovery of the accelerating expansion of the Universe through observations of distant supernovae”. More generally, observations over the past decade strongly favour a ‘concordance’ model in which the Universe is flat and contains approximately 5% ordinary atomic matter, 25% Cold Dark Matter and 70% Dark Energy. The Dark Energy paradigm and its extensions pose fundamental questions about the origins of the Universe: is Dark Energy an actual ingredient, or should Einstein’s gravity theory be modified? The international Dark Energy Survey (DES) is designed to probe the origin of the accelerating universe and help uncover the nature of dark energy by measuring the 14-billion-year history of cosmic expansion with high precision, mapping 300 million galaxies over 1/8 of the sky. DES will use four complementary techniques in a single survey for probing dark energy: Galaxy clustering, weak gravitational lensing, supernovae and galaxy cluster counts. 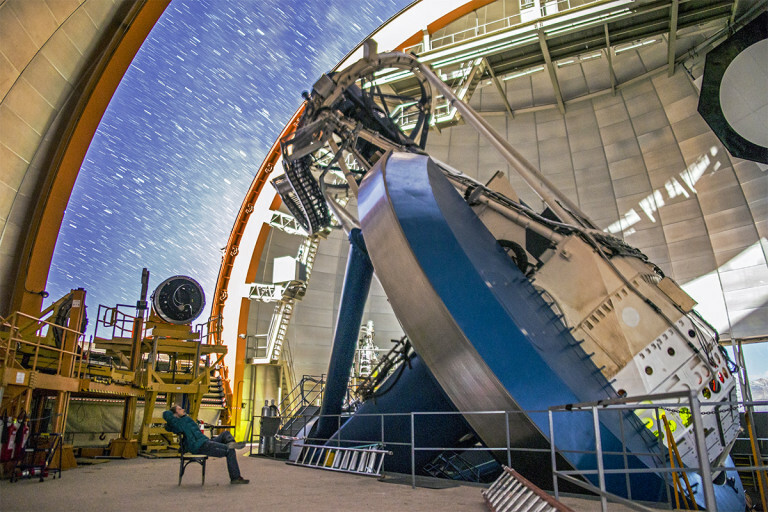 The survey science requirements have driven the construction of the Dark Energy Camera, DECam, an extremely sensitive 570-megapixel wide field camera and the most powerful survey instrument of its kind, which has been mounted on the Blanco 4-m telescope at the Cerro Tololo Inter-American Observatory (CTIO) in Chile. The survey has brought together over 300 scientists from six countries (the US, the UK, Spain, Brazil, Germany and Switzerland). DES:UK members are based in UCL, Portsmouth, Cambridge, Nottingham, Sussex, Edinburgh and Manchester. UCL astronomers are playing leading roles in DES.